Making text a lighter grey is a great way to de-emphasize it on white backgrounds, but it doesn’t look so great on colored backgrounds. That’s because the effect we’re actually seeing with grey on white is reduced contrast. 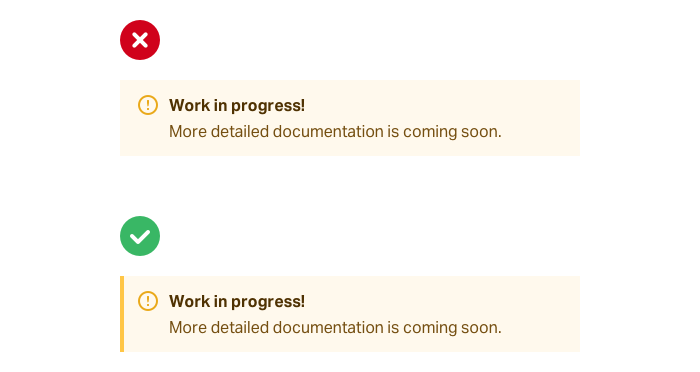 Making the text closer to the background color is what actually helps create hierarchy, not making it light grey. Use white text and lower the opacity. This lets the background color bleed through a bit, de-emphasizing the text in a way that doesn’t clash with the background. This works better than reducing the opacity when your background is an image or pattern, or when reducing the opacity makes the text feel too dull or washed out. Choose a color that’s the same hue as the background, adjusting saturation and lightness until it looks right to you. 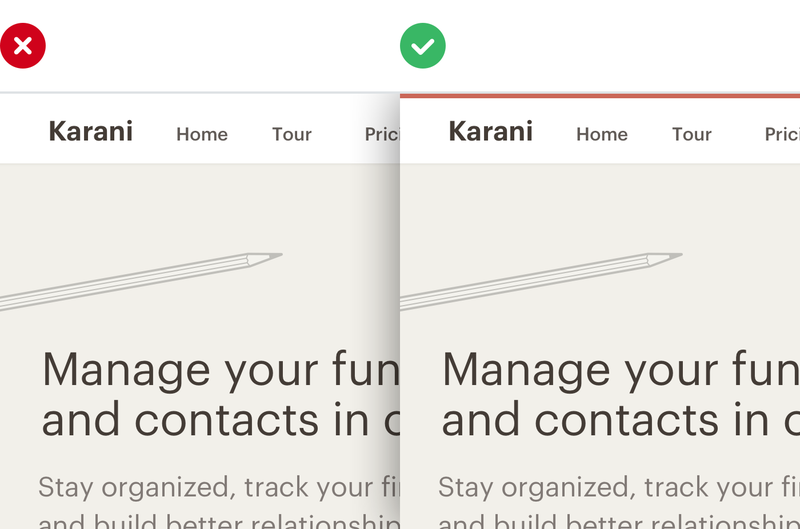 Instead of using large blur and spread values to make box shadows more noticeable, add a vertical offset. It looks a lot more natural because it simulates a light source shining down from above like we’re used to seeing in the real world. 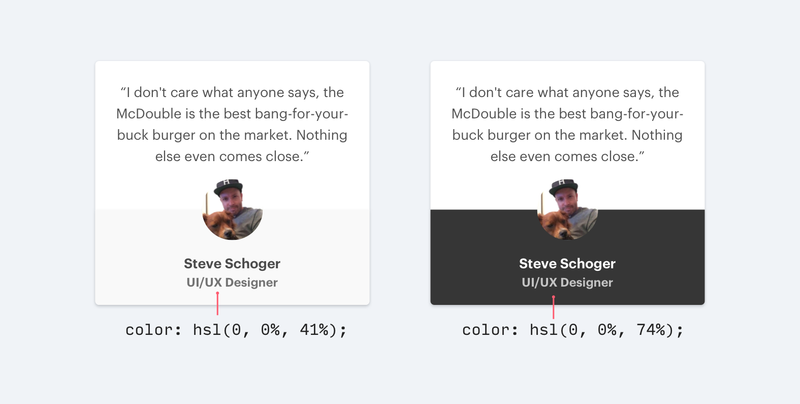 If you’re interested in learning more about shadow design, the Material Design Guidelines are a fantastic primer. When you need to create separation between two elements, try to resist immediately reaching for a border. 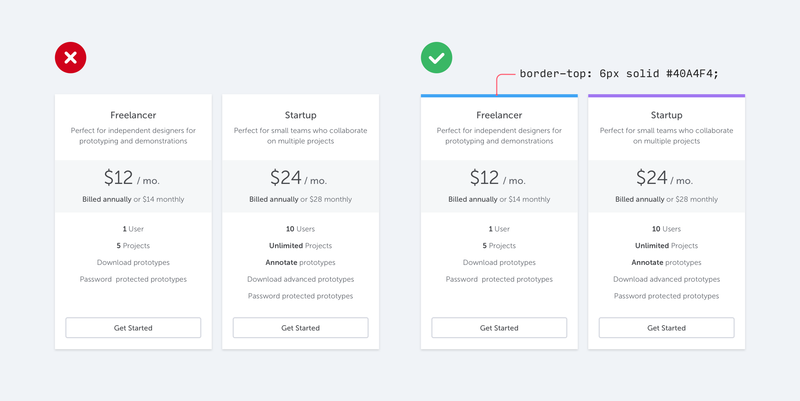 While borders are a great way to distinguish two elements from one another, they aren’t the only way, and using too many of them can make your design feel busy and cluttered. 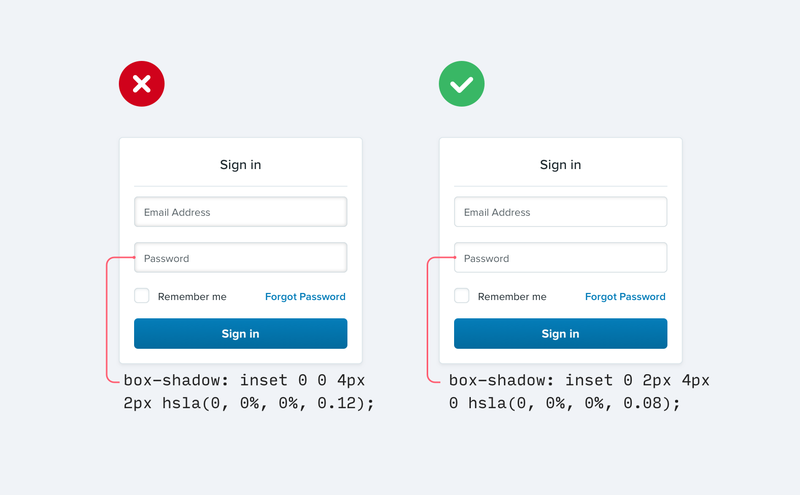 Box shadows do a great job of outlining an element like a border would, but can be more subtle and accomplish the same goal without being as distracting. 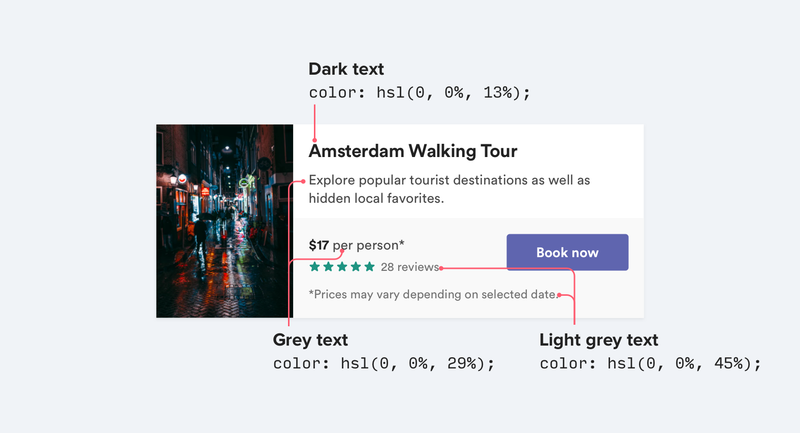 Giving adjacent elements slightly different background colors is usually all you need to create distinction between them. 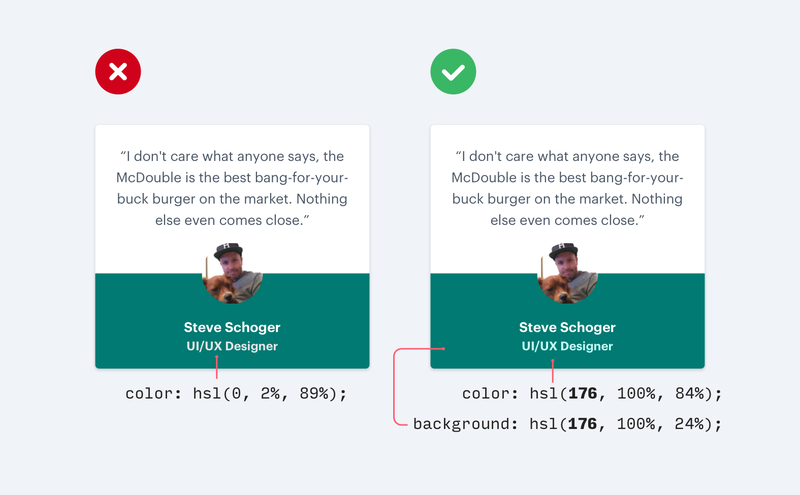 If you’re already using different background colors in addition to a border, try removing the border; you might not need it. What better way to create separation between elements than to simply increase the separation? 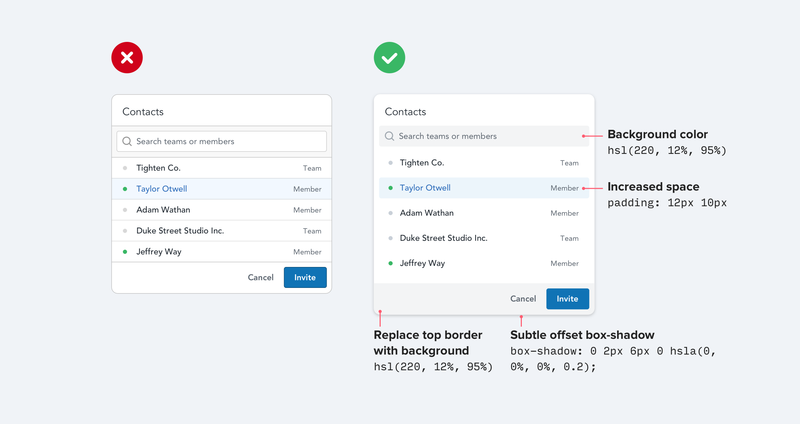 Spacing things further apart is a great way to create distinction between groups of elements without introducing any new UI at all. 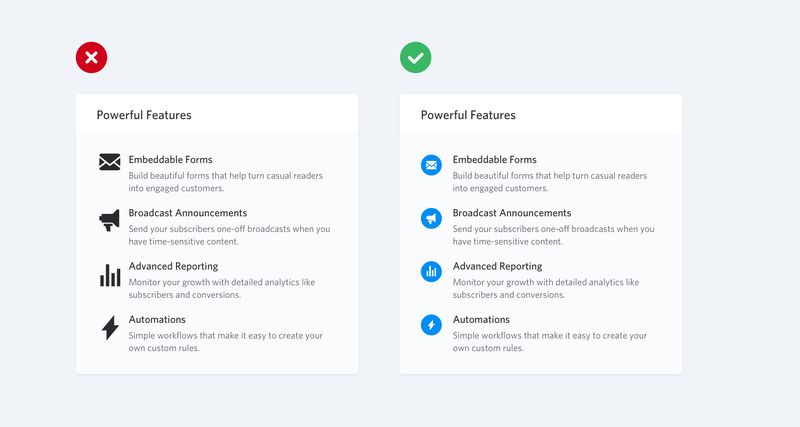 If you’re designing something that could use some large icons (like maybe the “features” section of a landing page), you might instinctively grab a free icon set like Font Awesome or Zondicons and bump up the size until they fit your needs. They’re vector images after all, so the quality isn’t going to suffer if you increase the size right? While it’s true that vector images won’t degrade in quality when you increase their size, icons that were drawn at 16–24px are never going to look very professional when you blow them up to 3x or 4x their intended size. They lack detail, and always feel disproportionately “chunky”. This lets you keep the actual icon closer to its intended size, while still filling the larger space. If you have the budget, you could also use a premium icon set designed to be used at larger sizes, like Heroicons or Iconic. 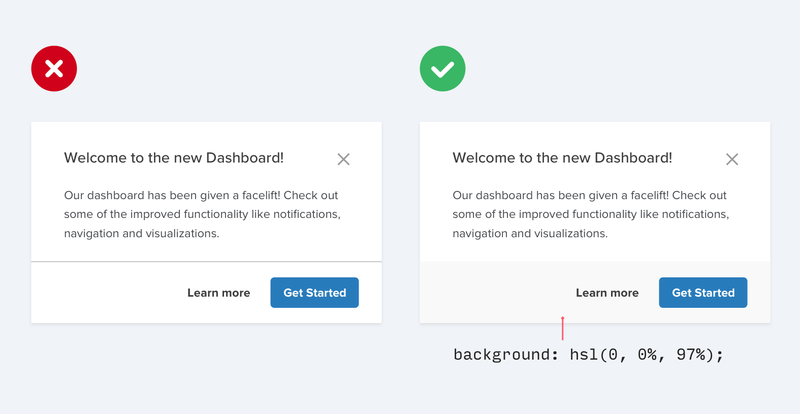 If you’re not a graphic designer, how do you add that dash of visual flair to your UI that other designs get from beautiful photography or colorful illustrations? 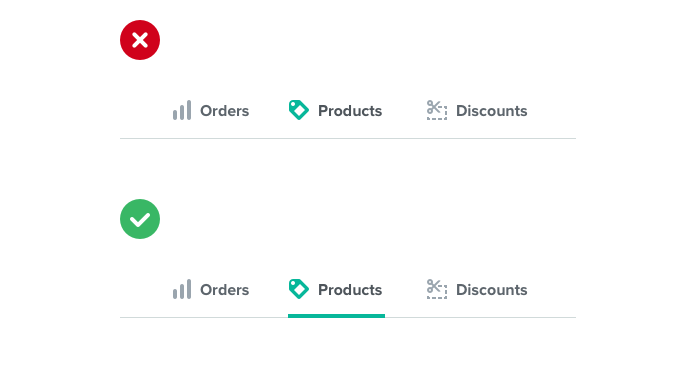 One simple trick that can make a big difference is to add colorful accent borders to parts of your interface that would otherwise feel a bit bland. Have a hard time picking colors? 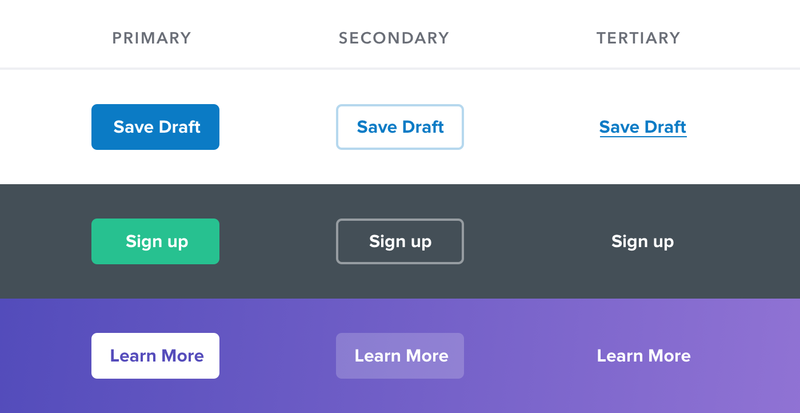 Try choosing from a constrained palette like Dribbble’s color search to avoid feeling overwhelmed by the endless possibilities of a traditional color picker. 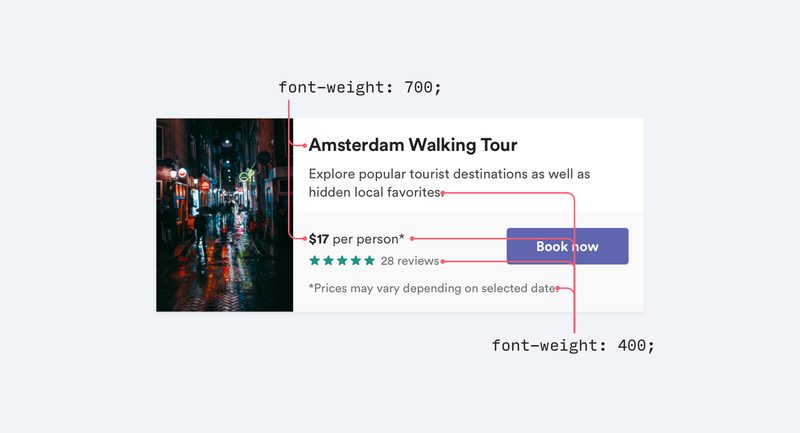 When there are multiple actions a user can take on a page, it’s easy to fall into the trap of designing those actions based purely on semantics. 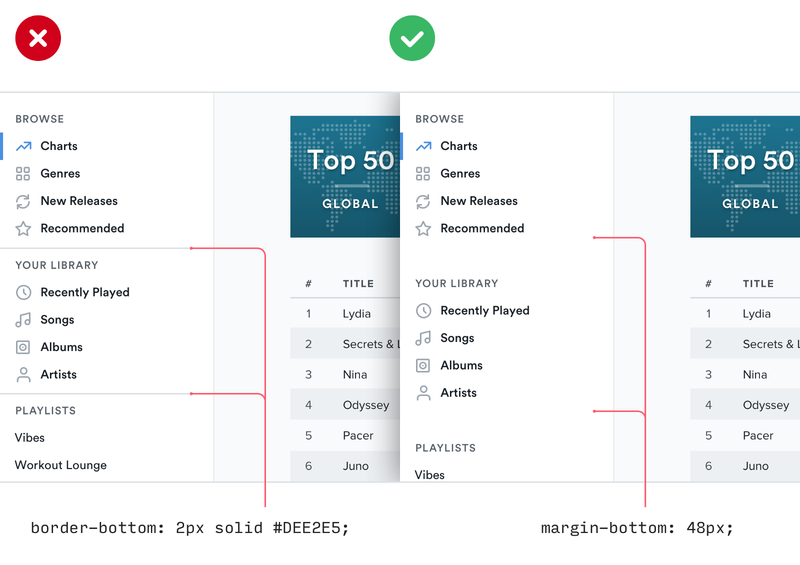 Semantics are an important part of button design, but there’s a more important dimension that’s commonly forgotten: hierarchy. Every action on a page sits somewhere in a pyramid of importance. Most pages only have one true primary action, a couple of less important secondary actions, and a few seldom used tertiary actions. 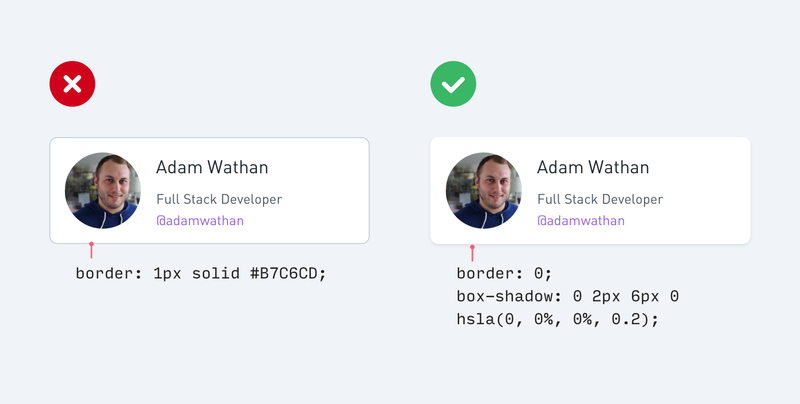 When designing these actions, it’s important to communicate their place in the hierarchy. Primary actions should be obvious. Solid, high contrast background colors work great here. Secondary actions should be clear but not prominent. Outline styles or lower contrast background colors are great options. Tertiary actions should be discoverable but unobtrusive. Styling these actions like links is usually the best approach. Not necessarily! 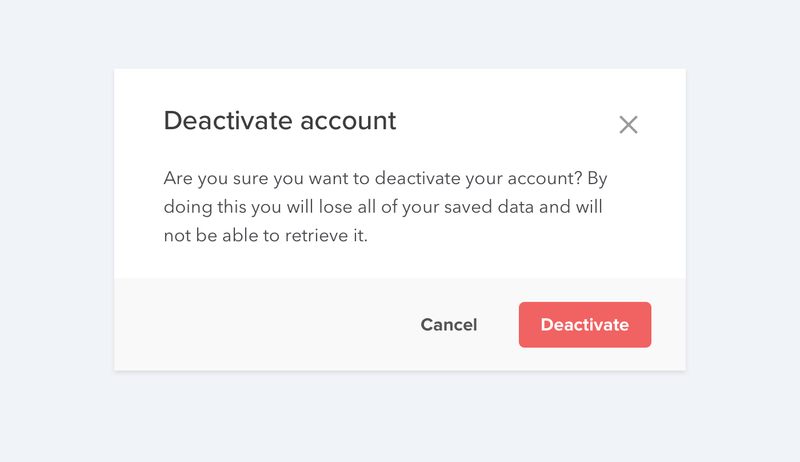 If the destructive action isn’t the primary action on the page, it might be better to give it a secondary or tertiary button treatment. Enjoy this post? We just released a book! 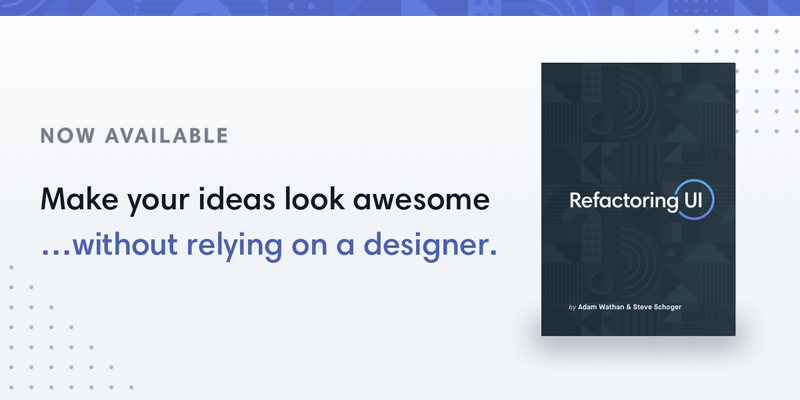 Refactoring UI takes everything we know about design and bundles it into one comprehensive package, including a book, screencasts, a component gallery, custom designed assets, and more. Over 6000 people have picked it up so far, and the feedback has been amazing. If you’re interested, head over to RefactoringUI.com/book to learn more and download a sample. 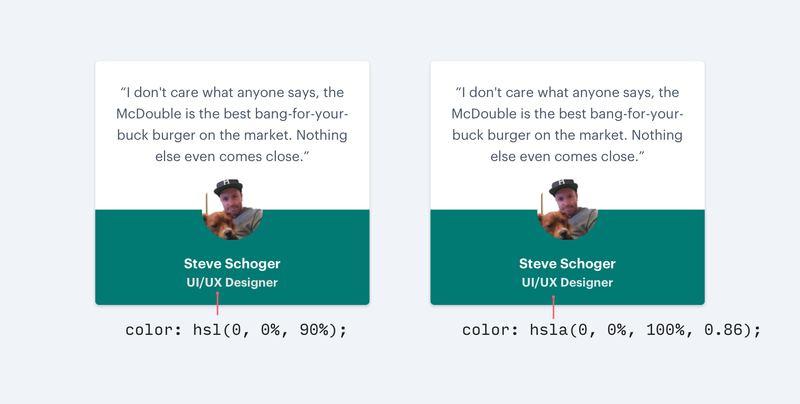 Learn UI design through case studies on improving user-submitted projects with specific tactics and actionable advice.